Can Booties Make A Better Hiking Boot? Can separating a boot’s liner from its outer make it better? Upmarket Canadian brand Arc’teryx just launched its first footwear range, distinguished by its use of interchangeable booties. This is what it’s like to wear them and what their designer has to say. “We thought we could introduce something with more climate comfort, durability and performance to our users,” explains the boots’ designer, Federico Sbrissa. What Arc’teryx has done is separate the traditionally unified boot outer and liner into two separate parts, while innovating the construction of both. The benefits are said to be fit, comfort, ventilation, durability and weight, all while allowing you to tailor the level of insulation to your needs and while enhancing the properties of the Gore-Tex waterproof membrane. In short, they claim to have improved virtually every facet of how a hiking boot is supposed to perform. Let’s start with the outer. Where traditional boots construct theirs by stitching together multiple panels of leather, synthetic or, most often, both materials, Arc’teryx has made its upper from a single piece of polyurethane-coated nylon. Two layers of TPU-coating on the non-perforated parts give it a smooth, strong, impermeable and abrasion-resistant finish that should last a very, very long time. Compared to traditional boot materials, it better prevents penetration and wear, all in a slimmer, lighter layer. That strength is supplemented by rubber toe and heel bumpers laminated to the upper for a permanent connection that shouldn’t melt or peel off, as traditional glued construction can. Very large panels on each side are free of the TPU coating, exposing the nylon mesh material and backed by significant perforation. This, in combination with the air that’s free to circulate all the way around the separate inner bootie are said to maximize ventilation. Traditional boots stitch their Gore-Tex booties into the boot’s outer, creating numerous seams and therefor potential points of failure. Such designs also reduce Gore-Tex’s breathability; air has nowhere to go as it flows outwards. “Designing the liner separately and with stretchable materials allows it to conform to individual feet for a custom-fit feeling,” explains Federico. “The fact that you can remove the liner also makes it possible to dry it quickly, clean it and use it as a hut slipper.” That’s camp shoes to you and I, something your feet will appreciate after a long day on the trail. There’s currently two types of liners available — simple Gore-Tex for moderate weather and the same, plus synthetic insulation for colder climates. The below-the-ankle approach shoes use low-cut liners and the boots a high-cut design. All are interchangeable between any other design of the same size. All ship with the uninsulated Gore-Tex liner, while the insulated alternative is available for purchase separately. I’ve been wearing the Bora 2 Mid boot for the last week. 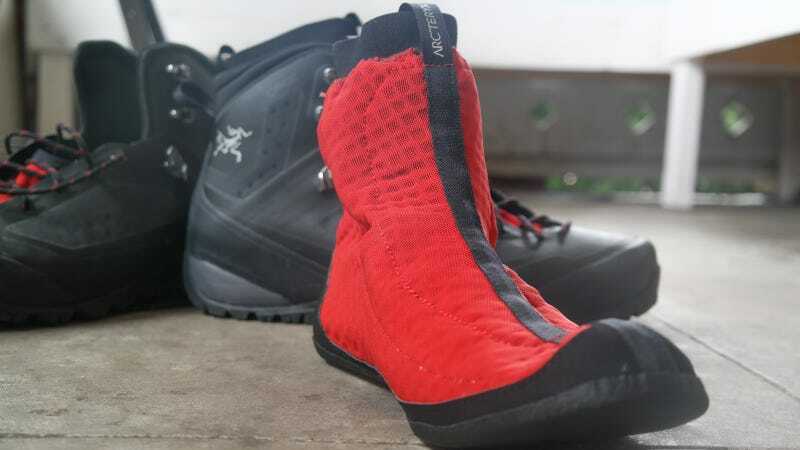 Its uninsulated Gore-Tex booties are constructed with a ventilated foam mesh chassis that fosters excellent breathability, while also providing padding between your foot and the boot’s upper. Compared to traditional, built-in Gore-Tex boot liners, it has only a single line of stitching running down the top, middle of your foot, underneath, then back up your heel. Fewer stitches equals a stronger, longer lasting waterproof/breathable membrane. A traditional insole rides inside the bootie, on top of its rubberized sole. I immediately replaced mine with high-volume, orthopedic Superfeet Grey insoles. These make up for the Bora 2’s lack of arch support, provide some needed heel-retention and help secure your foot inside the boots’ voluminous interior. The Boras fit true-to-size, but their inside dimensions are generously tall and wide, with a curiously narrow toe box and wide heel. Neither do the booties alter your sock choice; keep wearing the merino items of your chosen height and weight. One disappointment is that the elastic cuff at the top of the bootie isn’t neoprene and doesn’t seal tightly, either in its fit or construction. It’s stitched to the bootie, with visible holes, so don’t expect it to keep water out if you need to wade through a shallow stream. Looking at pictures of the boots before receiving a pair, this was my greatest hope for the them. While it is fair to say that the booties deliver a higher level of submersion than traditional sewn-in designs, they’ll be subject to the same flooding as normal boots should you exceed their height. You should, however, be able to dry them out quicker than traditional, unified boot designs. While the outer boot has no materials that will absorb water, it has no drainage ports lower than the ventilation panels on its side. This leads to perhaps the greatest missed opportunity with Arc’teryx’s new footwear range, at least in my opinion. Not only does writing their name as a possessive involve too many apostrophes, but simply being able to choose between insulated or uninsulated booties fails to take complete advantage of that design or offer enough differentiation over traditional boots. I’d love to see a membrane-free, highly-ventilated, easily-drained bootie added to the available range for very warm or very wet conditions; drainage is more important than waterproofness if you’re fording deep water. The brand also talks up the “custom” fit offered by the booties, but there seems to be little substance to that, beyond the additional padding. Actually being able to tailor the fit of the boot — say with more or less padding around the toes and/or heel — would offer a genuine level of customized fit. Perhaps as this new range matures and iterates, a greater range of booties and ones equipped with a neoprene, water-blocking cuff will be offered. Fingers crossed. Elsewhere, Arc’teryx has done a good job of offering the traction, support and protection of a mountaineering boot in something that’s much lighter, much more comfortable to wear and with its own, unique, futuristic look. A week hasn’t been enough time to break them in yet, but I’ll report back with a more in-depth review once I’ve put in some more miles. Chris Brinlee Jr took the non-studio shots.